"This is a good way to get the kids to eat asparagus." Bring a large pot of lightly salted water to a boil. Cook egg noodles in the boiling water, stirring occasionally, until cooked through but firm to the bite, about 5 minutes; drain. Stir noodles, tuna, black olives, and cream of mushroom soup together in the bottom of a casserole dish. Add 2/3 cup Cheddar cheese, hot pepper sauce, and black pepper to the noodle mixture; mix. Gently fold asparagus into the noodle mixture. Sprinkle remaining Cheddar cheese over the dish. I used broccoli instead of asparagus and it turned out great. I have a no garlic & onion eater so used my usual celery as a sub. Boring, too many distinct flavors that never melded. Texture just 'mush'. Completely uninteresting. Already deleted from my recipe box. Won't be making again. Simple and tasty. 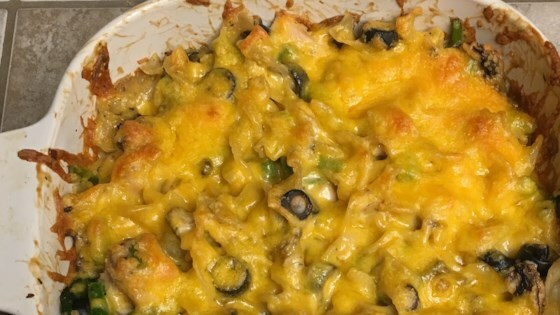 Nice variation on tuna casserole! The Tabasco gave it a little kick.